In an article originally published on June 7, 2018, the authors review techniques and tools available to improve surgical competency and reduce the risk for component malpositioning, as well as provide expert recommendations for surgeons who perform total hip arthroplasty. For a near anatomic positioning, acetabular cup placement should have 40°±10° of abduction and 15°±10° of anteversion. Medialization of the acetabular component optimizes joint reaction forces, but it also increases the risk for reduced global offset, decreased ROM until impingement, and reduces acetabular bone stock for future revision surgery. Medialization should be tailored to each individual patient. Preoperative surgical templating should be performed for all patients using standardized digital radiographs with known magnification or a known reference marker. The transverse acetabular ligament is a reliable anatomic structure that can improve the surgical accuracy and consistency of acetabular cup depth, height and version. Computer-assisted navigation and robotic surgery have demonstrated improved component positioning, reduced surgical variability and may be a useful asset in complex THA. Preoperative templating is regarded by many surgeons as an essential step in the preparation for THA (Figure 1). Although no study to date has investigated the direct effects of templating on improved acetabular positioning versus not templating the hip, 80% to 97% of the implanted cups can be correctly estimated within a ±1 stem size when templating is used. [14,15] Thus, templating allows surgeons to preoperatively select an appropriately sized component inventory, which reduces surgical idle time. In addition, templating encourages the surgeon to think 3-dimensionally and anticipate complex anatomy and potential intraoperative complications. Figure 1. Anteroposterior pelvis radiographs demonstrate presurgical templating of the hip and results at the 2-week post-surgery follow-up. Acetabular anteversion has also been shown to affect polyethylene wear, but it is more commonly identified as playing a greater role in THA stability. [4,7,18] As with inclination, the existence of an anteversion safe zone is now being questioned. Abdel et al  reported that 69% of posterior and 33% of anterolateral THAs were complicated by subsequent hip dislocation despite cups being placed in the anteversion safe zone. Although cup placement in most of the hips that dislocated fell within the Lewinnek safe zone,  cup placement outside the safe zone has been found to increase the relative risk of dislocation. In a study by Biedermann et al,  a U-shaped distribution was observed for anterior and posterior dislocations as acetabular anteversion angles deviated from 15° bi-directionally. Patients with less than 4° or more than 24° of anteversion were at 6-times greater risk for posterior and anterior dislocations, respectively. Current studies are limited in assessing other complications related to anteversion, potentially due to the difficulties of evaluating anteversion using standard postoperative imaging. Even when evaluating 342 controls in the study by Biedermann et al,  only one third of the hips could be evaluated for cup anteversion using digital radiographs. In summary, most dislocations following THA occur in patients whose acetabular cups were placed within the Lewinnek safe zone, although the relative risk for dislocation is greater in patients in whom acetabular cup placement falls outside the safe zone. It is also evident that known and unknown patient factors, such as spinopelvic alignment and developmental dysplasia of the hip (DDH), are unaccounted for at this time and may affect the outcome of THA in a subset of patients. Current evidence on how to identify and surgically manage these patient factors is lacking, but with the advent of new technologies, such as full-body, 3-dimensional radiographs, new guidelines are likely to be developed in the near future. Using a standard supine AP radiograph of the pelvis, the acetabular component should be appropriately templated at 40° of inclination with respect to the horizontal tear drop line. The medial border of the cup is medialized towards the radiographic teardrop. The biochemical advantage of medializing the hip’s CoR and obtaining improved bony purchase must be balanced against the risk of acetabular protrusion and the need to preserve bone stock. The inferior border of the acetabular cup should be approximately in line to the inferior border of the radiographic teardrop line. The superior aspect of the acetabular cup should maximize bony coverage, but up to 33% of acetabular cup may be uncovered. Femoral neck osteotomy should also be accounted for to ensure proper restoration of the patient’s leg length discrepancy and global offset of the hip. Milone et al  assessed rigid pelvic positioners for their reliability in patients in the lateral decubitus position for computer-navigated THA. With the computer navigation system’s arm placed into the wound, true anteversion angles deviated by more than 5° in 41% of patients and more than 10° in 22% of patients compared with the surgeon’s predicted anteversion angle. Similarly, actual inclination angles also deviated from the surgeon’s expected inclination angles by more than 5° in 18% of patients and more than 10° in 2% of patients. These alterations in positioning are likely due to patient positioning and patient positioner type used. Lower extremity manipulation and dislocation has also been shown to introduce additional pelvic pitch and roll. [31,32] In a study by Nishihara et al,  mean pelvic movement following hip dislocation resulted in 12°±4° of posterior pelvic tilt, 2°±4.4° of pelvic inclination, and 7°±5° of pelvic internal rotation. These studies demonstrate the need for a reliable technique to assess 3-dimensional pelvic orientation intraoperatively. The transverse acetabular ligament (TAL), identified by Archbold et al,  is an anatomic structure that has been proposed to reliably re-approximate the anteversion, height, and depth of the natural hip (Figure 2). [8,33] Successful intraoperative identification of the TAL occurred in 99.7% of 1000 consecutive THAs, of which only 0.6% dislocated over an 8 to 41-month follow-up period. In a randomized control study by Meermans et al,  acetabular component positioning using the TAL resulted in a significantly more accurate and less variable placement of the acetabular cup. More importantly, no acetabular components fell outside the Lewinnek safe zone when assessed by postoperative radiographs, compared with 20% of free-handed acetabular cups that did. Beverland et al  have further described identification of the TAL. Figure 2. The TAL should be well exposed for optimal acetabular positioning. Subsequent cup placement should be placed parallel to the TAL for optimal anteversion and to assist in assessing the most appropriate depth and height of the cup. With the growing popularity of direct anterior approach THA, some surgeons have proposed the use of intraoperative fluoroscopy to improve acetabular positioning, and several studies have demonstrated the benefits of fluoroscopic guidance when used with this approach. [37,38] When comparing the direct anterior approach with fluoroscopy with a standard posterior approach, the results become less clear. Although many of these variables are modifiable, it may be impractical to modify some of them – for example, surgical approach and volume – in an established orthopaedic practice. Instead, these risk factors should serve as a reminder of situations in which more attention should be paid during acetabular cup positioning. Complete exposure of the acetabulum should be performed, with adequate removal of the overlying soft tissue and osteophytes covering the acetabular rim. Removal of soft tissue in the proximity of the inferior acetabulum should be performed to adequately expose and identify the TAL. Relative to the TAL, the acetabular cup should be placed parallel or slightly anteverted to the TAL. However, in patients with an abnormal TAL – as in the case in DDH, acetabular retroversion, ankylosing spondylitis, lumbosacral fusion, and other spinal deformities – the anteversion presented by the TAL may be inadequate for proper acetabular placement. Considerations should be made for advanced imaging, computer navigation and a discussion with a spinal surgeon. Although computer navigation and robotic-assisted surgery reduce the variability seen with component positioning and potentially increase ROM, no study to date has demonstrated clinically significant superiority. [31,41,45–47] The literature available on these systems only evaluates short-term outcomes. It is hypothesized that their perceived benefits may only be apparent with longer-term follow-up. Additional imaging. Most computer navigation and robotic systems require advanced imaging prior to surgery, exposing patients to high radiation doses. Increased costs. Many systems require specific hardware, software, instrumentation, and training, which add substantially to the cost of THA without short-term clinical justification. It should be recognized that computer navigation and robotic-assisted THA provide surgeons with reliable alternatives for the positioning of THA components, particularly in complex cases in which freehand alignment techniques and anatomic landmarks may be less reliable than in a native hip. 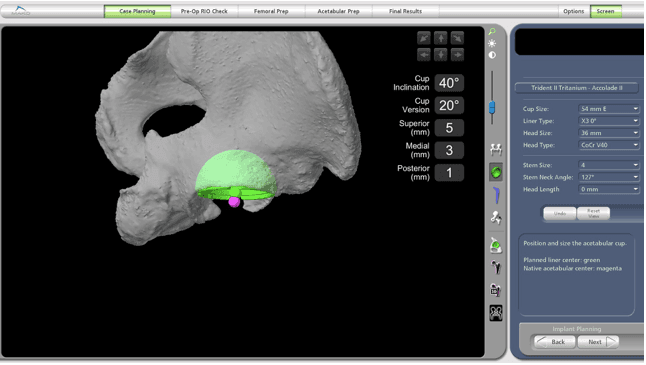 Preoperative advanced imaging and 3-dimensional templating continue to be critical elements for appropriate placement of the acetabular cup in computer-navigated and robotic-assisted surgery (Figure 3). Poor patient positioning may cause suboptimal surgical exposure, reference plane acquisition, stability assessment, and anatomic landmark verification, and therefore should not be overlooked. Although computer-navigated and robotic-assisted technologies are useful in complex cases, surgeons should be familiar with their use in standard primary THAs prior to their use in more complex surgical cases. Intraoperative placement of the acetabular component by computer-assisted guidance should be confirmed through conventional THA principles. Figure 3. Preoperative templating using 3-dimensional reconstructed CT images allows surgeons to better assess and plan surgical implantation of the acetabular component. All variables, including cup inclination, anteversion, and placement, may be optimized to the patient’s inherent factors. Complex THAs are frequently less forgiving than routine primary procedures. This is particularly true in patients with spinal pathology (eg, scoliosis and lumbar fusions) or hip dysplasia and those requiring revision surgery. The presence of a significantly disrupted anatomy limits the surgeon’s ability to align and position the acetabular component due to the distorted or obliterated anatomic landmarks, such as the sourcil line, TAL, and ilioischial and iliopubic lines. In a propensity score analysis, Perfetti et al  reported dislocation rates 7 times higher in patients with 4-level fusions than in patients with no fusion, demonstrating the need for careful preoperative planning and improved intraoperative techniques. As computer navigation and robotic systems become more reliable and affordable, their indications will likely broaden to incorporate more complex THAs, improving the accuracy and outcomes of these challenging surgeries. Acetabular component positioning continues to be a challenge even for the experienced orthopaedic surgeon. Simple techniques, such as preoperative templating, identification of anatomic landmarks, and surgical experience, have been shown to improve acetabular cup positioning and reduce complication rates. New technologies, including navigated instrumentation, may enhance surgical outcomes. James E. Feng, MD; Afshin A. Anoushiravani, MD; Nima Eftekhary, MD; Jonathan Vigdorchik, MD; and Ran Schwarzkopf, MD, MSc, are from NYU Langone Orthopedic Hospital, NYU Langone Health, New York, New York. Lee YK, Biau DJ, Yoon BH, Kim TY, Ha YC, Koo KH. Learning curve of acetabular cup positioning in total hip arthroplasty using a cumulative summation test for learning curve (LC-CUSUM). J Arthroplasty. 2014;29(3):586-589. doi:10.1016/j.arth.2013.07.023. Biau DJ, Meziane M, Bhumbra RS, Dumaine V, Babinet A, Anract P. Monitoring the quality of total hip replacement in a tertiary care department using a cumulative summation statistical method (CUSUM). Bone Joint J. 2011;93-B(9):1183-1188. doi:10.1302/0301-620X.93B9.26436. Bosker BH, Verheyen CCPM, Horstmann WG, Tulp NJA. Poor accuracy of freehand cup positioning during total hip arthroplasty. Arch Orthop Trauma Surg. 2007;127(5):375-379. doi:10.1007/s00402-007-0294-y. Lewinnek GE, Lewis JL, Tarr R, Compere CL, Zimmerman JR. Dislocations after total hip-replacement arthroplasties. J Bone Joint Surg Am. 1978;60(2):217-220. Callanan MC, Jarrett B, Bragdon CR, et al. The John Charnley Award: Risk factors for cup malpositioning: Quality improvement through a joint registry at a tertiary hospital. In: Clinical Orthopaedics and Related Research. Vol 469. Springer; 2011:319-329. doi:10.1007/s11999-010-1487-1. Domb BG, Redmond JM, Louis SS, et al. Accuracy of component positioning in 1980 total hip arthroplasties: a comparative analysis by surgical technique and mode of guidance. J Arthroplasty. 2015;30(12):2208-2218. doi:10.1016/j.arth.2015.06.059. Patil S, Bergula A, Chen PC, Colwell CW, D’Lima DD. Polyethylene wear and acetabular component orientation. J Bone Jt Surg. 2003;85(suppl 4):56-63. http://www.ncbi.nlm.nih.gov/pubmed/14652394. Accessed September 9, 2017. Beverland DE, Rutherford M, Molloy D, et al. Placement of the acetabular component. Bone Jt J. 2016;98(11):37-43. doi:10.1302/0301-620X.98B1. Della Valle AG, Padgett DE, Salvati EA. Preoperative planning for primary total hip arthroplasty. J Am Acad Orthop Surg. 2005;13(7):455-462. doi:10.1007/s00264-011-1289-4. Leslie IJ, Williams S, Isaac G, Ingham E, Fisher J. High cup angle and microseparation increase the wear of hip surface replacements. In: Clinical Orthopaedics and Related Research. Vol 467. ; 2009:2259-2265. doi:10.1007/s11999-009-0830-x. Brodner W, Grübl A, Jankovsky R, Meisinger V, Lehr S, Gottsauner-Wolf F. Cup inclination and serum concentration of cobalt and chromium after metal-on-metal total hip arthroplasty. J Arthroplasty. 2004;19(8):66-70. doi:10.1016/j.arth.2004.09.003. De Haan R, Pattyn C, Gill HS, Murray DW, Campbell PA, De Smet K. Correlation between inclination of the acetabular component and metal ion levels in metal-on-metal hip resurfacing replacement. J Bone Jt Surg – Br Vol. 2008;90-B(10):1291-1297. doi:10.1302/0301-620X.90B10.20533. Walter WL, O’Toole GC, Walter WK, Ellis A, Zicat BA. Squeaking in ceramic-on-ceramic hips. The importance of acetabular component orientation. J Arthroplasty. 2007;22(4):496-503. doi:10.1016/j.arth.2006.06.018. González Della Valle A, Comba F, Taveras N, Salvati EA. The utility and precision of analogue and digital preoperative planning for total hip arthroplasty. Int Orthop. 2008;32(3):289-294. doi:10.1007/s00264-006-0317-2. Gamble P, de Beer J, Petruccelli D, Winemaker M. The accuracy of digital templating in uncemented total hip arthroplasty. J Arthroplasty. 2010;25(4):529-532. doi:10.1016/j.arth.2009.04.011. Esposito CI, Gladnick BP, Lee Y-Y, et al. Cup position alone does not predict risk of dislocation after hip arthroplasty. J Arthroplasty. 2015;30(1):109-113. doi:10.1016/j.arth.2014.07.009. Abdel MP, von Roth P, Jennings MT, Hanssen AD, Pagnano MW. What safe zone? The vast majority of dislocated THAs are within the Lewinnek safe zone for acetabular component position. Clin Orthop Relat Res. 2016;474(2):386-391. doi:10.1007/s11999-015-4432-5. Biedermann R, Tonin A, Krismer M, Rachbauer F, Eibl G, Stöckl B. Reducing the risk of dislocation after total hip arthroplasty: the effect of orientation of the acetabular component. J Bone Joint Surg Br. 2005;87(6):762-769. doi:10.1302/0301-620X.87B6.14745. Reikeråls O, Bjerkreim I, Kolbenstvedt A. Anteversion of the Acetabulum and femoral neck in normals and in patients with osteoarthritis of the hip. Acta Orthop Scand. 1983;54(1):18-23. doi:10.3109/17453678308992864. Krebs V, Incavo SJ, Shields WH. The anatomy of the acetabulum: What is normal? Clin Orthop Relat Res. 2009;467(4):868-875. doi:10.1007/s11999-008-0317-1. Iglič A, Antolič V, Srakar F. Biomechanical analysis of various operative hip joint rotation center shifts. Arch Orthop Trauma Surg. 1993;112(3):124-126. doi:10.1007/bf00449986. Heller MO, Schröder JH, Matziolis G, et al. Muskuloskeletale belastungsanalysen. Biomechanische erklärung klinischer resultate – Und mehr? Orthopade. 2007;36(3):188-194. doi:10.1007/s00132-007-1054-y. Nawabi DH, Meftah M, Nam D, Ranawat AS, Ranawat CS. Durable fixation achieved with medialized, high hip center cementless THAs for Crowe II and III dysplasia. Clin Orthop Relat Res. 2014;472(2):630-636. doi:10.1007/s11999-013-3187-0. Bhaskar D, Rajpura A, Board T. Current concepts in acetabular positioning in total hip arthroplasty. Indian J Orthop. 2017;51(4):386-396. doi:10.4103/ortho.IJOrtho_144_17. Archibeck MJ, Cummins T, Junick DW, White RE. Acetabular loosening using an extended offset polyethylene liner. In: Clinical Orthopaedics and Related Research. Vol 467. ; 2009:188-193. doi:10.1007/s11999-008-0479-x. Giori NJ. Offset acetabular components introduce torsion on the implant and may increase the risk of fixation failure. J Arthroplasty. 2003;18(1):89-91. doi:10.1054/arth.2003.50018. Maratt JD, Esposito CI, McLawhorn AS, Jerabek SA, Padgett DE, Mayman DJ. Pelvic tilt in patients undergoing total hip arthroplasty: when does it matter? J Arthroplasty. 2015;30(3):387-391. doi:10.1016/j.arth.2014.10.014. Dandachli W, Islam SU, Richards R, Hall-Craggs M, Witt J. The influence of pelvic tilt on acetabular orientation and cover: A three-dimensional computerised tomography analysis. HIP Int. 2013;23(1):87-92. doi:10.5301/HIP.2013.10715. R. Mellano C, Spitzer AI. How does pelvic rotation or tilt affect radiographic measurement of acetabular component inclination angle during THA? J Orthop. 2015;12(4):222-227. doi:10.1016/j.jor.2015.05.009. Milone MT, Schwarzkopf R, Meere PA, Carroll KM, Jerabek SA, Vigdorchik J. Rigid Patient positioning is unreliable in total hip arthroplasty. J Arthroplasty. 2017;32(6):1890-1893. doi:10.1016/j.arth.2016.12.038. Schwarzkopf R, Muir JM, Paprosky WG, Seymour S, Cross MB, Vigdorchik J. Quantifying pelvic motion during total hip arthroplasty using a new surgical navigation device. J Arthroplasty. 2017:1-5. doi:10.1016/j.arth.2017.04.046. Nishihara S, Sugano N, Nakahodo K, et al. Measurement of pelvic tilting angle during total hip arthroplasty using a computer navigation system. In: Springer, Berlin, Heidelberg; 2000:1176-1179. doi:10.1007/978-3-540-40899-4_124. Archbold HAP, Mockford B, Molloy D, McConway J, Ogonda L, Beverland D. The transverse acetabular ligament: an aid to orientation of the acetabular component during primary total hip replacement: a preliminary study of 1000 cases investigating postoperative stability. J Bone Joint Surg Br. 2006;88(7):883-886. doi:10.1302/0301-620X.88B7.17577. Meermans G, Van Doorn WJ, Koenraadt K, Kats J. The use of the transverse acetabular ligament for determining the orientation of the components in total hip replacement: a randomised controlled trial. Bone Joint J. 2014;96-B(3):312-318. doi:10.1302/0301-620X.96B3.32989. Epstein NJ, Woolson ST, Giori NJ. Acetabular component positioning using the transverse acetabular ligament: Can you find it and does it help? In: Clinical Orthopaedics and Related Research. Vol 469. Springer; 2011:412-416. doi:10.1007/s11999-010-1523-1. Fujita K, Kabata T, Maeda T, et al. The use of the transverse acetabular ligament in total hip replacement: An analysis of the orientation of the trial acetabular component using a navigation system. Bone Joint J. 2014;96-B(3):306-311. doi:10.1302/0301-620X.96B3.32726. Hiddema WB, Van der Merwe JF, Van der Merwe W. The transverse acetabular ligament as an intraoperative guide to cup abduction. J Arthroplasty. 2016;31(7):1609-1613. doi:10.1016/j.arth.2016.01.019. Gosthe RG, Suarez JC, Mcnamara CA, Calvo C, Patel PD. Fluoroscopically Guided Acetabular Component Positioning: Does It Reduce the Risk of Malpositioning in Obese Patients? 2017. doi:10.1016/j.arth.2017.04.045. Goodman GP, Goyal N, Parks NL, Hopper Jr. RH, Hamilton WG. Intraoperative fluoroscopy with a direct anterior approach reduces variation in acetabular cup abduction angle. Hip Int. July 2017:0-0. doi:10.5301/hipint.5000507. Leucht P, Huddleston HG, Bellino MJ, Huddleston JI. Does intraoperative fluoroscopy optimize limb length and the precision of acetabular positioning in primary THA? Orthopedics. 2015;38(5):e380-6. doi:10.3928/01477447-20150504-54. Nam D, Sculco PK, Su EP, Alexiades MM, Figgie MP, Mayman DJ. Acetabular component positioning in primary THA via an anterior, posterolateral, or posterolateral-navigated surgical technique. Orthopedics. 2013;36(12):e1482-e1487. doi:10.3928/01477447-20131120-10. Bozic KJ, Kurtz SM, Lau E, Ong K, Vail TP, Berry DJ. The epidemiology of revision total hip arthroplasty in the United States. J Bone Jt Surgery-American Vol. 2009;91(1):128-133. doi:10.2106/JBJS.H.00155. Goudie ST, Deakin AH, Deep K. Natural acetabular orientation in arthritic hips. Bone Joint Res. 2015;4(1):6-10. doi:10.1302/2046-3758.41.2000286. 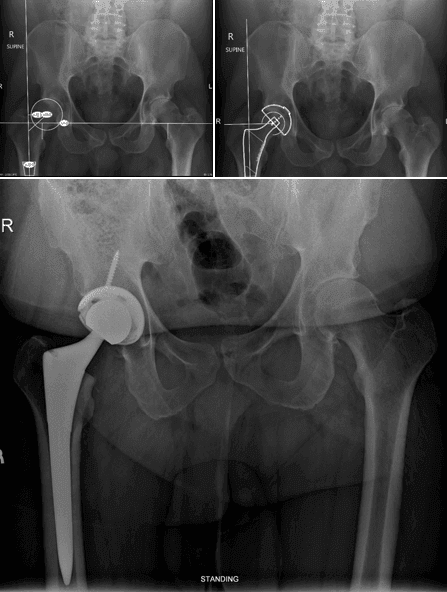 Jolles BM, Genoud P, Hoffmeyer P. Computer-assisted cup placement techniques in total hip arthroplasty improve accuracy of placement. Clin Orthop Relat Res. 2004;(426):174-179. doi:10.1097/01.blo.0000141903.08075.83. Petrella AJ, Stowe JQ, D’Lima DD, Rullkoetter PJ, Laz PJ. Computer-assisted versus manual alignment in THA: A probabilistic approach to range of motion. In: Clinical Orthopaedics and Related Research. Vol 467. Springer; 2009:50-55. doi:10.1007/s11999-008-0561-4. Keshmiri A, Schröter C, Weber M, Craiovan B, Grifka J, Renkawitz T. No difference in clinical outcome, bone density and polyethylene wear 5-7 years after standard navigated vs. conventional cementfree total hip arthroplasty. Arch Orthop Trauma Surg. 2015;135(5):723-730. doi:10.1007/s00402-015-2201-2. Xu K, Li Y min, Zhang H feng, Wang C guang, Xu Y qiang, Li Z jun. Computer navigation in total hip arthroplasty: A meta-analysis of randomized controlled trials. Int J Surg. 2014;12(5):528-533. doi:10.1016/j.ijsu.2014.02.014. Deep K, Shankar S, Mahendra A. Computer assisted navigation in total knee and hip arthroplasty. SICOT-J. 2017;3:50. doi:10.1051/sicotj/2017034. Confalonieri N, Chemello C, Cerveri P, Manzotti A. Is computer-assisted total knee replacement for beginners or experts? Prospective study among three groups of patients treated by surgeons with different levels of experience. J Orthop Traumatol. 2012;13(4):203-210. doi:10.1007/s10195-012-0205-z. Perfetti DC, Schwarzkopf R, Buckland AJ, Paulino CB, Vigdorchik JM. Prosthetic dislocation and revision after primary total hip arthroplasty in lumbar fusion patients: a propensity score matched-pair analysis. J Arthroplasty. 2017;32(5):1635-1640.e1. doi:10.1016/j.arth.2016.11.029. Next articleIs the Indication for RTSA a Risk Factor for Transfusion after Surgery?